Taking its presence in India a notch higher, Uber Eats, the world’s largest food delivery platform, today announced the appointment of leading actress and youth icon, Alia Bhatt, as its brand ambassador. India will be the first country for Uber Eats globally, to have appointed a brand ambassador. "Alia is an inspiration to Indian millennials and we are thrilled to have her on board. The youth today relates to her easy-going, carefree and energetic personality. She is known for her unique style and agility as an actor - the same qualities are an integral part of the Uber Eats DNA; thus making her the perfect fit to represent our brand in India. We are excited to have Alia on board, as we stay focused on building and strengthening our presence in India,” said Bhavik Rathod, Head of Uber Eats India and South Asia. 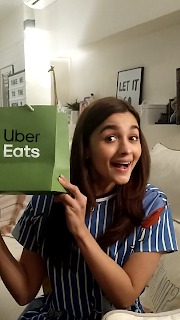 Alia Bhatt, expressing her excitement as Uber Eats’ first brand ambassador said, “My work hours and plans keep changing, so the freedom/flexibility to get what I’m craving for whenever I want, right at the tap of a button, almost seems magical. I’m delighted to be associated with a young, innovative and energetic brand like Uber Eats and I look forward to all the excitement that’s in store with this partnership. Uber Eats India’s association with Alia Bhatt will lay the foundation for a host of brand-led interventions in the coming year. Besides being the face of the brand, consumers can expect to see Alia in different moods and never seen before avatars on social media platforms. Uber Eats recognizes the appetite for food delivery in India and in the past year and a half, has emerged as the fastest growing food delivery app. In 2018, Uber Eats will continue to focus on technology innovations and empowering people to broaden horizons of convenience and experience in the food delivery space.